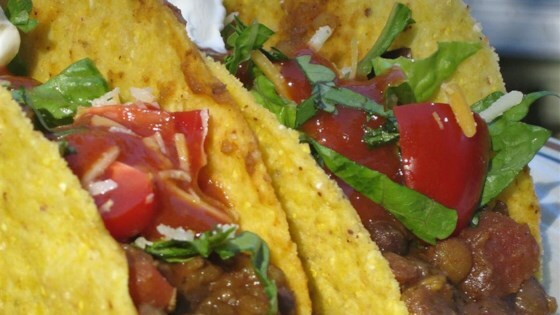 "This fun taco dish is both healthy and delicious. It will be a hit with the entire family! Serve with your favorite taco fillings, such as sour cream, chopped tomatoes, shredded lettuce, and Cheddar cheese." Heat oil in a skillet over medium heat; cook and stir onion and garlic until tender, about 5 minutes. Mix lentils and taco seasoning into onion mixture; cook and stir for 1 minute. Pour chicken broth into skillet and bring to a boil. Reduce heat to low, cover the skillet, and simmer until lentils are tender, 25 to 30 minutes. Uncover the skillet and cook until mixture is slightly thickened, 6 to 8 minutes. Mash lentils slightly; stir in salsa. Serve about 1/4 cup lentil mixture in each taco shell. Great use of lentils. Didn't change a thing. Turned out great. Will make it again and again.